The sophomore star returned to Michigan State -- shocking both his coach and his mom -- to pursue a calling that perhaps only he and his teammates can appreciate. 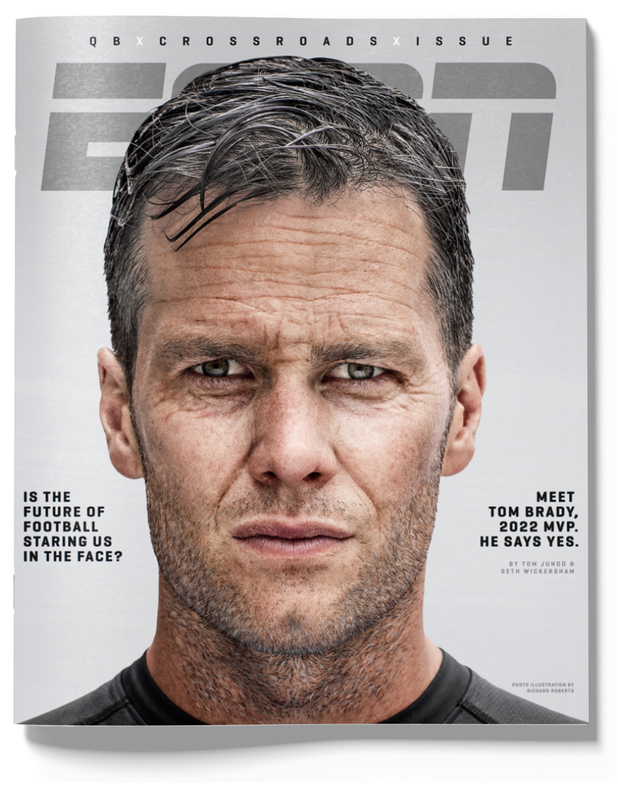 This story appears in ESPN The Magazine's Nov. 13 QBs at a Crossroads issue. Subscribe today! I find myself, unexpectedly, at an informal Bible study in a nondescript Michigan State dorm room. I squeeze onto a couch beside two or three earnest-looking college kids. I think the spot I've claimed may have actually belonged to Spartans star sophomore forward Miles Bridges. There was this awkward thing that happened when I first arrived: I picked the seat out, plugged in my rapidly dying phone near it, then went to get some water. In my absence, Bridges came to the spot on the couch, hovered over it, appeared ready to snag it, but then he got pulled away. And so I slipped back in. From his point of view, was it reasonable to suspect I just straight up took his seat? Yes. Did I do it on purpose? Maybe. All I've heard since I got to campus is how kind Miles Bridges is. How unfailingly polite. How humble. Maybe the reporter in me wants to test the veracity of these claims. He is without doubt the biggest and most important athletic figure in this room and possibly on this campus. He was a projected NBA lottery pick after just one statistically dominant season. His crossovers made national highlights. His 3s put daggers in his opponents' hearts. And yet he stayed in East Lansing. Tonight, he has every reason to flex a little in this dorm room filled with wide-eyed young Christians and teammates; every reason to say calmly but with great authority, "Hey man, you took my seat." Maybe I want to see if he will. He does not. Instead, once I sit down, he seems to quietly appraise the situation before wandering over to the kitchen area of the same big room. The students, about 15 in all, already occupy every available space. So Miles folds his 6 feet 7 inches onto the cold kitchen floor, leans his back against the stove and extends his long legs in front of him. In this way, he sits quietly for nearly 90 minutes listening to his teammates read and talk about Scripture. Senior point guard Lourawls "Tum Tum" Nairn Jr. is the de facto leader of both the team and this Bible study. He is a compact young man, tightly wound and seemingly constructed entirely of muscle. He has boundless energy and enthusiasm, with kind eyes and a handshake and a joke for literally everyone who works in Michigan State athletics. Sophomore combo guard Josh Langford functions as something of the straight man of the group. I would deem him Most Likely to Call Every Adult Sir or Ma'am. Arriving late to the study is 6-foot-8 big man Xavier Tillman. Though only a freshman, Tillman is so firmly accepted by this group that the study won't begin without him. When Tillman does arrive, he carries his reason for being late: his infant daughter, whom he holds and dotes on for the majority of the evening. The night's topics range from having a relationship with God to reconciling shaken faith to the easy lure of temptations. These kids are wrestling, in their own earnest way, with the deepest spiritual questions they can think of. And sitting on the floor is one of the top-ranked basketball players in the country. At the end, we are asked to share what part of the night had the biggest impact on us. When Bridges' turn comes, he seems lost in thought. "I'm just still thinking about the question of what is your life's purpose." "I Mean, He's just a different kid," Michigan State coach Tom Izzo tells me. "Zero ego. He's kind of a throwback." Izzo has sat me down in an athletic center conference room on one of those mild late-summer Midwestern mornings, pillowy clouds expanding seemingly forever outside the windows. He is now leaning back to tell me, in his own yarn-spinning way, the story of how Miles Bridges made The Decision. In his freshman season, Bridges averaged 16.9 points -- the highest for a freshman at the school since Magic Johnson -- and 8.3 rebounds a game. NBA scouts spent much of the season salivating over his guard/forward hybrid game, one that merges size and athleticism with an appetite for perimeter play, ballhandling and shooting. He entered Michigan State as the eighth-best recruit in the country, according to the ESPN 100. He was projected by some to go as high as 12th in the 2017 NBA draft. Millions of dollars were lying in wait for the kid. He was a one-and-done if ever there was one. And everybody wants to be in the NBA, right? So. Why did he come back? Like the rest of us, Izzo assumed Bridges would leave. In January, he was even making jokes about it. "So freshmen carry the bags," Izzo begins. "Everybody piles on Miles because he's the star ... and I said, 'Hey, Miles, want to know what the bad news is for you? Next year you're going to get screwed because you're going to be carrying someone else's bags [in the NBA].' I start laughing, and he just looks at me and doesn't say nothing. So a couple of weeks later, I said something similar. And he just says, 'Coach, why you always trying to get rid of me?' And honest to god that was the first time I said, 'What is he doing?' It had never even occurred to me." 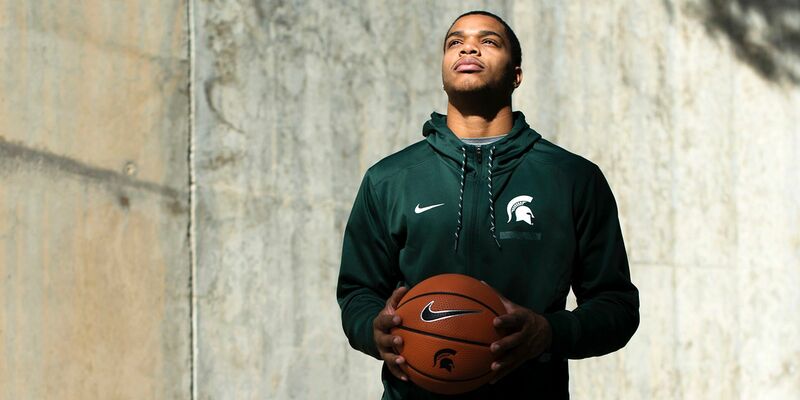 As the year wore on, Izzo remained so unequivocally in denial about the potential of a Miles Bridges sophomore season that before the first game of the NCAA tournament, he huddled with Bridges and former Spartan Draymond Green to discuss the protocol of a potential postgame "I'm going pro" announcement, should the Spartans have been eliminated. Bridges said nothing, according to Izzo, but "looked at both of us like we were drunk." It wasn't until the season was over -- Michigan State fell to Kansas in the second round -- that Bridges began to open up to his coach about his trepidations. "I asked Miles, 'Why do you want to stay?' His first answer was, 'I want to get to a Final Four and I want to try to win a national championship,'" Izzo says. "I love you for it," Izzo recalls telling his star player, "but I can't have you stay for that because getting to a Final Four is a 5 percent chance if you're really good." He pushed Bridges to think harder. Still another week passed, and Izzo was driving the campus with Bridges one night. Bridges' mother had learned her son was hedging on going pro and asked the coach to speak with him. Izzo found himself in the unusual position of trying to talk a star out of playing for him. "I asked him, 'Are you getting sick of me yet?'" Izzo recalls. "He said, 'Yeah.'" Izzo was not the first person Bridges ultimately told. That honor went to Tum Tum and Josh. Though both are purposefully vague about when, exactly, Miles confided in them that he was leaning toward staying, they both tell me it was "very, very early." These are the people Miles spends most of his time with. They live together, they play together, they pray together. In a sense, Michigan State basketball is an island for Bridges. Even before Louisville coach Rick Pitino was fired following an FBI investigation that uncovered a massive alleged cash-funneling scheme across Division I schools, the business of NCAA basketball was far removed from a bunch of college kids eating tortilla chips in a dorm room and discussing how best to serve God. There was the North Carolina academics scandal, the Tulane point-shaving scandal, O'Bannon vs. the NCAA. All this in a sport that generates billions but does not pay the players. But what lies on the other side? This is what Bridges wondered when he talked to Magic Johnson, Steve Smith, Draymond Green. The MSU alums told him the truth of NBA life. You get a lot of money. But it is a job. The pressure is on you. Guys, even good ones, get drafted, cash nice checks and still find themselves scraping away in the G League, hustling in second-tier towns in front of small crowds, sometimes for years. Tyler Ennis. James Young. Jordan Adams. P.J. Hairston. All of these men were the Miles Bridges of their respective high schools or colleges. And now they were scrambling to latch on to or stay with an NBA roster. This turned out to be the final reason Bridges gave Izzo for wanting to stay. He knew success in college wasn't guaranteed. But he knew success in the NBA was even harder to come by. And at least in college, he is not alone. The Bridges home in Flint, Michigan, is humble and welcoming. When I arrive, Cynthia Bridges, tall, with a gentle voice and a deliberate way of speaking, chides me for not parking in the driveway. She invites me in and offers a water from the 3-foot-high stack of bottles common in kitchens in Flint. She and her daughter, Tara, nine years Miles' senior, are happy to tell me stories about Miles' childhood. There was the way he used to wake up and play basketball in the driveway at 8 a.m., so early a neighbor had to ask Cynthia if she could do something about it. There was the way he used to rouse Tara out of bed to play one-on-one before breakfast. And when she would beat him, he would keep demanding more games. Eventually she had to physically pick him up and remove him from the court. And, of course, there was the time he was one of the most talented players in the country, and instead of going pro and being able to help out the family that helped him all those years, he decided to spend another year playing basketball for free. Cynthia comes across as bewildered as anyone when she tries to explain why her son made this decision. "He said God," she tells me. "You know, he prayed, and God told him." Even after he had broken the news to her, she found herself telling reporters he was undecided. She was hoping he would change his mind. "'There's things I want to accomplish at MSU,'" Cynthia remembers her son saying. "'I want to win a championship.' I said you can win a championship and get money. What does he tell me? He says, 'Money is the root of all evil.'" It is the permanent curse of parents that their adult children will make choices that vex them to no end. Some get unfortunate tattoos, some take questionable spouses, some forgo their education to live on organic communes outside of Portland. For Cynthia, the situation is similar. Only exactly the opposite. "I worked hard to get his shoes. All those sacrifices and he's like, 'You'll be all right.'" She shakes her head. "I'm happy the way he is. It was just a shock." When Cynthia leaves the room for a moment, I take the opportunity to ask Tara what she really thinks about her little brother's decision. "I like it," she confides. "I was excited because I'm not ready for that lifestyle, just as much as he's not." I finally sit down with Bridges himself in the film room of the athletic complex on campus, and the truth is he doesn't have much to say. He is clearly uncomfortable talking about himself. Nonetheless he is unfailingly polite and good-natured. He tells me what everyone else has told me. He has personal goals. He wants to win a championship. He wants to be really, really ready for the NBA. He has faith. Since we are meeting directly after practice and workouts, a team assistant has procured him a chicken sandwich from his favorite place. He thanks the guy no fewer than three separate times. I want to talk to Bridges about how great he is, what wonderful things are ahead for him, but it is not long before he's telling me about last November's game against Kentucky at Madison Square Garden, the second game of his college career. "I wanted to prove to them that I was better than any player they had on their team," he tells me, reliving it. "And that I made out-of-the-ordinary plays, shot out-of-the-ordinary shots." Carmelo Anthony was at that game. John Wall. It was the biggest stage he had played on. And his worst game: six points on 2-for-11 shooting, with nine turnovers. Bridges says he is not a crier. But that night he cried. He told the team the loss was his fault. Afterward he talked late into the night with Josh and Tum. They told him he could not get the game back. They told him they loved him. He told himself to believe that even at his lowest point, God could bring him to his highest. The next game he scored 21 points in the first half. The other thing Bridges and I find ourselves talking about is purpose. It's been on his mind since Bible study. "I feel like my purpose is to use basketball as a platform to help people get closer to God," he says. "I feel like I could reach a lot of people once I get to the NBA." The cynic in me feels the need to protect him from disappointment. I gently point out that the NBA as I've seen it is not a place that is particularly religious. "I'm not religious," he points out quickly, and perhaps a little defensively. "I just have a great relationship. It's not about religion; it's about the relationship. The relationship that you have with God. Everybody in the NBA knows about God. They just feel like if they express it then they wouldn't get cool points from that." After that we sit in silence for a long while. I want to see if he breaks it. He does not. So I ask him if he has any questions for me. He does. "How are you able to speak so well?" 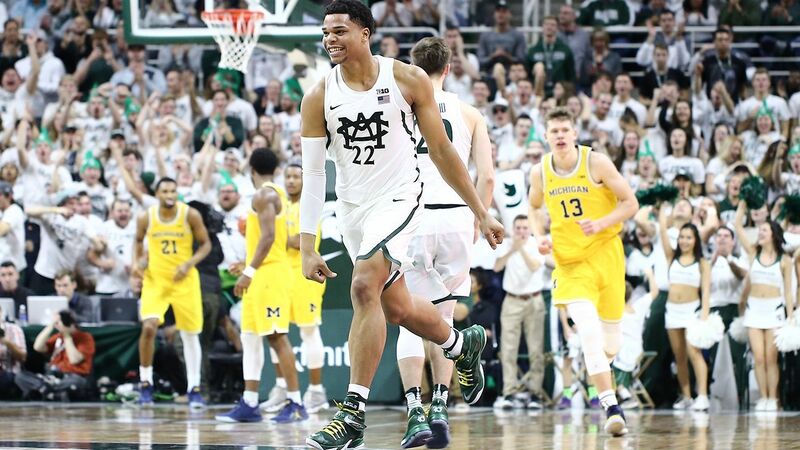 If you really want to know why Miles Bridges declined the NBA, you have to sit in a room with Tum, Josh and Xavier and ask them to tell you stories. They have just come from a long practice, but I ask each to share a story that to them is the quintessential Miles Bridges story. They light up. Tum starts: "Him and Josh, I feel like we came out of the same womb. That's how close we are." There is much laughter and head-shaking. "If I tell you the actual stuff that happened to us," Josh tells me cryptically, "you're not going to believe it." Tum offers a more believable story instead. One night they're in the dorm room "talking about the things of God," he explains. It is early in the season, and the three of them are just getting to know one another. Here is Tum Tum, the stalwart hustle point guard, sitting with two McDonald's All American recruits. He's feeling them out. Will they be filled to the brim on their own press clippings? Things get deep as the conversation continues into the night. Tum looks over at Miles. "He was crying," Tum recalls. "Like, he just couldn't stop crying." A blue-chip recruit, a kid known for thunderous dunks, sitting in a dorm room feeling the spirit so deeply that it moved him to tears. Tum took notice: "I saw that and was like, 'There's something about him that makes him different.' It's that he understands that he is a spirit." Josh's story is a little different. "One day, me, Tum and Miles -- nobody in the gym. Coaches were gone and we're just going to play one-on-one. It was our first time ever playing against each other. Summer. Wasn't nobody there. And I knew Miles was good, but he won like four games straight. I'm like, 'I got to step it up.'" It feels to Josh like they played all day. Miles would win a game. Tum would win one. Josh would win one. Afternoon turns to evening. But just like Miles used to do with his sister when he was a little kid, he keeps pushing them. He'd win one game, then say he needed to win two. He'd win two, say he needed to win four. Evening becomes night. Miles is not a big trash-talker, they tell me, but that day he was on fire. "We were talking to each other like we just seen each other on the street," Tum tells me, "and he started it!" It's the day they came to actually know one another, to bond. Three boys who made their way through the ceaseless churn of summer leagues and prep schools and big-time collegiate recruiting and were now in a place where they met equals. Where they had found not just teammates but family. "The last thing I'll say about Miles," Tum adds: "Miles tells me he loves me every day. Every day. I'm not exaggerating. Every day." Imagine you are 19 years old. You grow up feeling like an outsider, only to discover you have size and power that sets you apart and makes people sniff around your family and call your house. Imagine that you come to a school to play ball and you find three people who love and embrace you as you discover your deepest and truest meaning. People who share with you everything from the glories of God to the glories of running it back infinitely while trash-talking until you have nothing left, until you have burned through your second, third and even final winds and your body ceases to be a body, becoming instead a vessel, a spirit. How much money would it take for you to give that up and join the world of adults? I ask Xavier if he has anything to add. "No," he tells me quietly. "I don't want to ruin it." MILES is still thinking about the question of what is your life's purpose. And the farther away I get from East Lansing, the more I think about a moment during the Bible study. Xavier, the 6-8, 260-pound 19-year-old father, is holding his baby daughter in his arms. Throughout the evening, she had been falling in and out of sleep, but she has finally succumbed to rest with a delicate little tremor and a sigh. Tum is holding forth to rapt attention about the nature of God and how to steer clear of temptation. Suddenly he is interrupted by a startling laugh that escapes from Xavier's body. Tum stops midsentence. We all wonder what he said that was so funny. "Oh, my bad," he says sheepishly. "She just, like, smiled at me in her sleep. It was so cute. She just was looking up at me in her sleep and she smiled." The room breaks out into hushed approving giggles and restrained awwws. The baby is swaddled in pink. Xavier is dressed in dark Spartan green. Thinking back on this moment, I swear I remember another color: a very faint but unmistakable golden light shining up from the baby's face and casting a honeyed glow onto Xavier. I'm sure that didn't happen. But you have to understand: To be in that room? At that moment? It feels like it did. These boys are holding something special. Something fragile and beautiful. They are holding it in their arms the way Xavier holds his daughter and, OK, sure, the way Mary held the baby Jesus. And the one thing they seem to know better than almost anyone else, better than parents, coaches or even journalists, is how to stop and look at it. How to smile at it. How to let its beauty and innocence affect every cell in their bodies. One thing they know better than all of us is how to truly appreciate it. Carvell WallaceWallace is a writer, editor and father in Oakland, Calif.